The question practically jumped off the screen. Sometimes it’s just ships passing in the night. And sometimes, just sometimes, when you ask the follow-up question, you get the answer you really want. 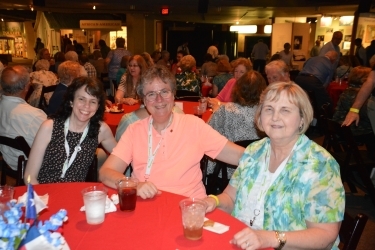 Case in point: On Wednesday, August 27, my cousin Paula and I were attending the 2014 Federation of Genealogical Societies conference in San Antonio. Our mothers — mine the older sister, hers the baby of the family — were both born in Texas so it was a special trip for us. I sat by the window, Paula by the aisle, and as other passengers boarded I went into my usual stare out the window totally oblivious to everything mode until I heard Paula’s whisper. That’s our mothers’ maiden name. Being the shy, retiring type that I am,3 I turned around to the woman, now taking a seat in the row behind us on the far side of the bus. It did. And Ruth Cottrell was from Texas. My radar started pinging. “We could be kin,” I said. She wasn’t convinced. Her branch of the family, she said, was a pretty localized branch there in a corner of Texas. Now the radar is pinging big time. I thought that sounded familiar, so I grabbed my smart phone and did a quick online search. Sure enough, there was a John Cottrell who’d served in the Civil War and who’d later moved to Comanche County4 who, we were pretty sure, was related somehow. I mentioned that. She still wasn’t convinced. She’d had her son do YDNA testing, you see, and he only matched a few people. I pulled up my uncle David’s results in the Cottrell surname project at Family Tree DNA, and asked her for her son’s name. Sure enough, he only matched a few people in the Cottrell surname project. And one of those he matches, at the 66-for-67 marker level, is my uncle David. We spent the rest of the evening, sitting together, trying to figure out who the common ancestor will turn out to be. The big issue for our group of Cottrell men is that there’s virtually no change in the YDNA in any of the lines that descend from Richard Cottrell who died in Henrico County, Virginia, in 1715. My line ended up in Texas by the mid-1840s. Cousin Ruth’s line ended up there around 1870. A third line was in Alabama by the 1830s. Others never left Virginia. And all the YDNA is ridiculously close — a tight group of 66-for-67 and 67-for-67 marker matches. We’ll probably have to do more testing to see if we can nail down exactly how far back we have to go before all of our lines converge — it it with Richard? with his son Thomas or son Richard? with a grandson? But think about the odds. One person from New Jersey, one from Virginia, one from Texas. All attending not just one conference, but one particular event at the conference, and ending up on the same bus. Surnames passing on a bus. Serendipity!!! I tell ya’, it’s alive and well in the genealogy arena!! One of yours and Paula’s long-ago ancestors put it in your minds to attend that event! I got goosebumps as soon as I started reading this post. Indeed, Mary Ann! I hadn’t planned to go, and therefore missed the deadline to buy a ticket. But, Judy found a woman who was selling her extra ticket, just a couple hours before the event. Really cool, isn’t it? Just amazing. It really IS amazing…so cool to find someone who’s related who has also done a lot of the genealogy and testing needed to try to confirm it! I’m still grinning over the whole thing, Kim! Great story, Judy! What fun that it happened at a genealogy conference. I look forward to reading more as you uncover the story. We have our fingers crossed on this one, my friend, and since this is my Cottrell line, you know you’ll be reading more as time goes by! I love this story! This has happened to me while attending a couple of the Salt Lake Institutes of Genealogy. I’m afraid to miss an institute, now! That’s a great reason for attending SLIG all by itself! Yeah, I was wondering what documentation you had for Footnote #3 that would satisfy the genealogical proof standard. Yay, Paula, for paying attention. For more documentation and genealogical proof, I can attest that I was there at the match’s birth and that he is one and the same that matches Judy’s and Paula’s uncle. Look at it this way, Ruth: you CHOSE this line by marrying into it!! I’m still giggling over the pure serendipity of meeting this way! Just out of curiosity — On my grandmother’s side are the Malones from Hamilton County as well as Comanche County and a few others. Any connections? I had a similar thing happen to me at the Lawrence County Library in New Castle, PA library. I was there to research my Russell line and ran into a Russell researcher/cousin. She was from Wisconsin and I was up from Texas. To really top my trip off, the librarian there gave me a bunch of document copies on my Fry line that someone had requested and not come in to pick up. Sometimes it is almost spooky. Not connected to me, darn it… but perhaps cousin Ruth has some connections! Gotta love these serendipity moments. You and your cousin meeting up in Pennsylvania! I’m a Comanche County native, raised a Proctor, and still hold the family farm there my English grandfather, John Cattle bought in 1886. I married a Comanche Cottrell, too. I have done extensive research in the county and don’t know of any Malone family. I checked the two volume Comanche County History published in 2008 and no pieces were submitted on a Malone family. My grandfather’s family is from Comanche County, too. Johnston, Hutson, Selman and Jones. His grandfather, Ruben M. Johnston & Olivia Jane Jones had 13 children there. Lots of Comanche County folks showing up! Neat! The name Ruben Johnston is not familiar, but there is a large Johnston family in Comanche descended from Ellen Zeleca Cottrell (1889-1967) and Thomas Johnston (d. 1946.) Ellen was the daughter of William Barton Cottrell. I am the family genealogist for the Comanche Cottrells with about 1200 Cottrells in my database. However, I don’t have any information on Ellen’s husband Thomas H. Johnston who might be connected to your Ruben. Any of this familiar to you? Something to check out, thanks! Congrats! Love these stories. Here’s a little different twist. My son had a good friend . After I “retired” I went to work for her father. He knew of my avid interest in genealogy so he hired me to research his family— looking for Native American. Well to make a long story short I didn’t find his Indian kin but he and I are 5th cousins on my maiden name line! So my son and his friend are 6th cousins. Yep its a crazy mixed up world. That’s really cool, Kelly! We ‘re all pretty much cousins one way or another, aren’t we?? I received an email from Ruth Cottrell (one of the “Surnames passing on a Bus”) with a link to the blog and the story. I especially enjoyed it because “small world” is one of my favorite pastimes when exposed to strangers. I am, like Ruth, a Cottrell Cousin by marriage. I believe (heavy emphasis on “believe” because I have not done any research) that my mother, Effie (Cottrell) Wheat, daughter of W.A. (William Asa) Cottrell and Elzora Sofronia (Byers) Cottrell, was a niece or great-niece of the John Cottrell you mention settling in Comanche County following the Civil War. I recall from my childhood many mentions of “Uncle John”, who was either my maternal grandfather’s brother or uncle, and I’m not sure which. I had thought they were brothers but the timeline you mentioned has made me question that now. Comanche is my hometown, and I own the house I grew up in there. I thoroughly enjoyed the story of “G.W. Cottrell, Black Sheep” and both the style and the substance of the blog. I have just subscribed and look forward to further editions. Nice to “meet” you, cousin Bill! We Cottrells do get around, don’t we? Actually, Bill, you are not going to get off that lightly, you are not a Cottrell by marriage like I am but a REAL one as your mother was a Cottrell. And Judy, Comanche is a small place – Bill and my husband, Dwain were classmates. (a) This is a hoot. (b) Ruth, be gentle. Bill and I didn’t have any choice but to be part of this family: we were born into it. You, on the other hand, voluntarily joined in the craziness by marrying into it! I’d be happy to exchange info, Paula! Hi Judy, Wow, what a truly amazing story. I figure it was simply “was meant to be”. Serendipity was at work. It doesn’t happen often, but when it does it is SOOOO exciting, it totally puts you on cloud 9 for months.